Free access, the trails open all the year. On foot, horse-drawn carriage or bicycle come to discover the natural heritage of the Camargue. Trusts, hikers, coach,leisure centre, we welcome you all the year, from 10 to 200 persons. Trainings for students and technicians. Occasional entertainment or project from kindergarten to high school. Eat on site, sleep near. Information and good advice, other points of interest to discover. The Vigueirat Marshes benefit many levels of protection at the national and international scale. Own by the « Conservatoire du Littoral », national agency since 2006, the Meyranne Marshes are managed by the Marais du Vigueirat. Discover all the cultural, artistic and musical events which involved the Vigueirat Marshes. The association « Les Amis des Marais du Vigueirat » in the process of getting back into work. The association « Les Amis des Marais du Vigueirat » are in partnership with different projects linked to the sustainable economical development of Mas-Thibert. 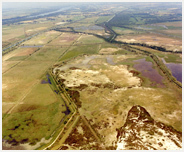 Since 1996 when the Vigueirat Marshes opened the site to the public, the Vigueirat Marshes lead a project open to the public based on the discovery of the natural heritage of the Camargue, in connection with the development of services in Mas-Thibert. Since 2010, the Vigueirat Marshes welcome an insertion work group called « maintenance of the natural area ». Management of the "Marais du Vigueirat"
Where, how and by whom the Vigueirat Marshes were managed before the creation of the Trust. Protect nature, welcome the public, act for a sustainable development of the territory. Understand the management method of the Vigueirat Marshes. Team composition and the various services of the Trust. Individually or family, you can support our actions by joining the Association « Les Amis des Marais du Vigueirat ». On the occasion of Mas-Thibert village festival,The Marais du Vigueirat will be the starting and arrival point of long abrivades. 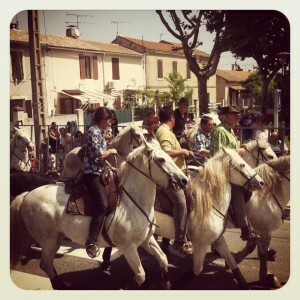 Camargues bull races are carried out by the Gardians and their horses. They will lead the bulls by the Marais du Vigueirat trail towards Mas-Thibert village.. A great opportunity to discover local traditions !